After the age of war had ended, the region of Kawara near the Kamo River flourished as a place of business for many street vendors and performers, due to the rebuilding of the Sanjo and Gojo bridges by Toyotomi Hideyoshi. Consequently, tea houses, seats and benches for spectating were also built for wealthy customers to use. This is the origin of the Nouryou-Yuka. 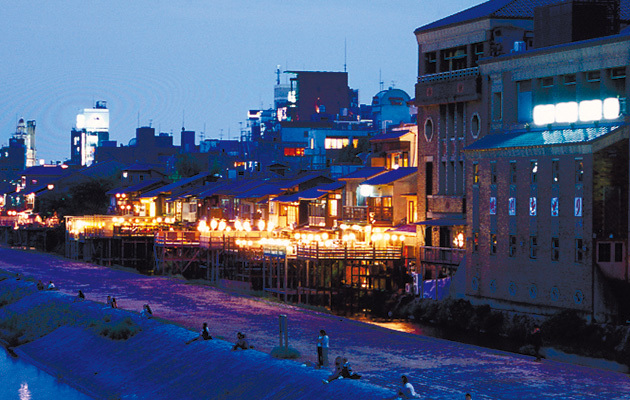 Stone walls and embankments were later constructed in the Edo period and Kawara became an entertainment area with a geisha district located nearby. It is said that great crowds of spectators gathered for the Miokoshi-arai (washing of the portable shrine) of the Gion festival and other festive occasions. During the middle period of the Edo period, the rules regarding the seating by the river became more systematically structured, with each tea house only being allowed to place a certain number of seats by the river. These seats of this time were mostly wooden fold-up chairs, benches and platforms placed on the riverbank and were called "the cooling off of Kawara". 【Picture】"Shijo Kawara Yusuzumi Kiitsu" by Yōzaburō Shirahata. 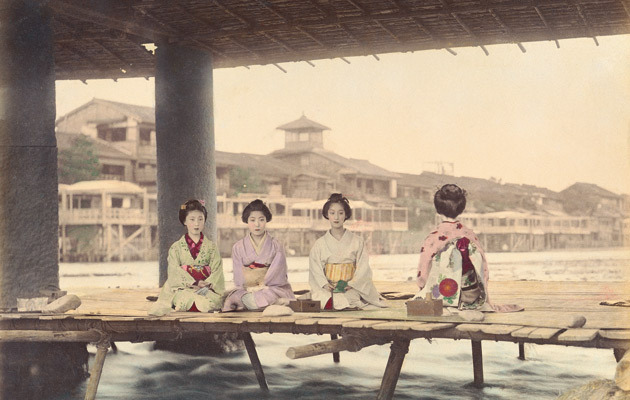 It was during the Meiji Period in which the constructing of the current day Yuka decks became a tradition during the months of July and August, and Yuka decks were constructed on both sides of the river. Different types of seating was made available, from elevated raised-floor type decks to low floor decks and benches on the sandbanks. The Yuka decks on the east side of the river were removed due to the excavation of the Kamo River Canal in 1894 as well as the extension of the Outousen Line of the Keihan Railway in 1915. Later in the Taisho period, seating down on the sandbar was prohibited due to flood-prevention construction work which created the Misogigawa waterway. In 1929, semi-permanent Yuka decks were prohibited. Nouryou-Yuka then took massive damage during the Muroto typhoon in 1934 and the severe torrential rains of the following year. Nouryou-Yuka was completely shut down during the years of World War II. After the war was over, the "Nouryou-Yuka Standards of License" was formulated in 1952 and became the standard for all Yuka decks. The Kyoto Kamogawa Nouryou-Yuka Association, the organization which issues permits for all Yuka decks, has since set the "Nouryou-Yuka installation regulations" and continues to strive in its efforts to pass on the culture of the Nouryou-Yuka to future generations. 【Photograph】Scene of yuka decks beside the Kamo river during nightfall. Kawara becomes and entertainment district with many performers and dancers and its festivities are illustrated in the emakimono (art scroll) "Shijo-Kawara-zu". Nouryou-Yuka is described in the "Annaisha (the guide", a book written by Kiun Nakagawa. The entertainment industry temporarily declines due to the Great Fire of Kyoto on March 8th. Shijo Kawara enters its secondary golden period. The peak of Shijo Kawara's prosperity is depicted in the works of Okyo Maruyama; the "Amusements in Kyoto in the Four Seasons" and "Illustrations of Famous Place in Edo" from 1780 and the "Pictorial guide to gardens in Kyoto" from 1799. 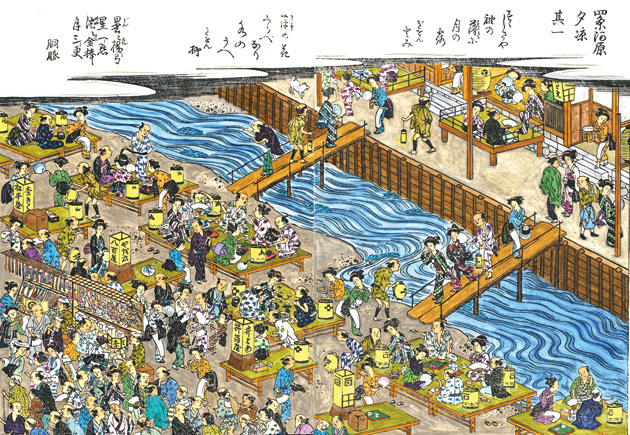 The scene of people dipping their feet into the water of the river is from a Yuka deck is depicted in the "Shijo-Kawara Makei". Constructing yuka decks in the 2 months between July and August becomes customary. Platform-style yuka decks appear all cross the Kamo River on the southeast side of the Shijo-ohashi Bridge. High elevated Yuka decks appear on the east side of the Shijo-ohashi Bridge. High elevated Yuka decks appear on the southeast side of the Shijo-ohashi Bridge. Platform-style decks appear below the Sanjo-ohashi Bridge while the sun is out. The Misogigawa Waterway is constructed by flood prevention construction work. The "Notice regarding installation of structures on the Kamo River" is circulated and the standards for Nouryou-Yuka decks is set. However, establishments that break the rules by using metal poles as their posts or putting roofs on continue to increase. Restrictions are put on constructing semi-permanent Yuka decks. The Muroto Typhoon hits Japan, resulting in approximately 3000 people dead or missing countrywide. Severe rainstorms occur in June. Kyoto city takes massive damage and all Nouryou-Yuka decks are completely washed away. What is repaired of it is what we see to this day. Nouryou-Yuka is disallowed due to the blackout orders of the Pacific War. A conference is held by the Kyoto city council in April. The "notice regarding raised-floor decks on the Kamo River" is circulated in May and a few establishments begin Nouryou-Yuka again. 40 to 50 establishments apply for the construction of Nouryou-Yuka decks. The operation of Yuka decks at night from May 1st to September 15th, and during the day in the single month of May is allowed. The operation of Yuka decks at night from May 1st to September 30th, and during the day in the months of May and September is allowed. The first "kiyoharae (purification ceremony)" is held. Receives the first JUDI award of excellence from the Japan Urban Design Institute. The Ougai-Hosho-kai is approved as the Kyoto Kamogawa Nouryou-Yuka Association in April. "Kamogawa Nouryou-Yuka" becomes a registered trademark as a local brand. Over 100 establishments apply for the construction of Nouryou-Yuka decks.